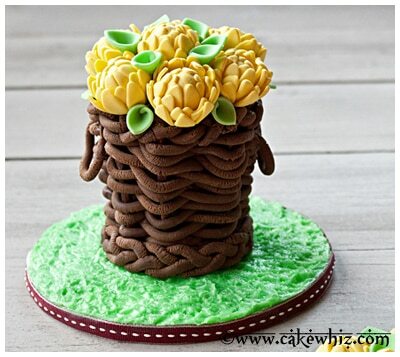 Use this step-by-step tutorial to learn how to make a fondant basket filled with flowers. 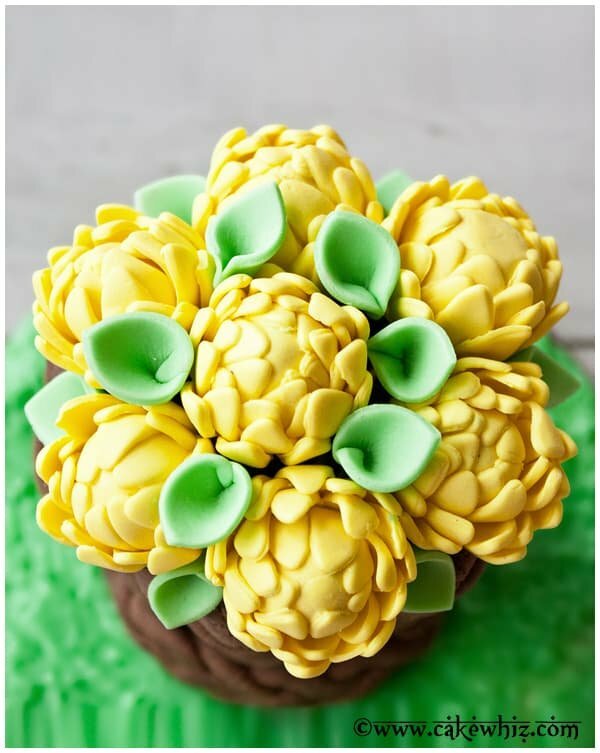 Makes a pretty cake topper! 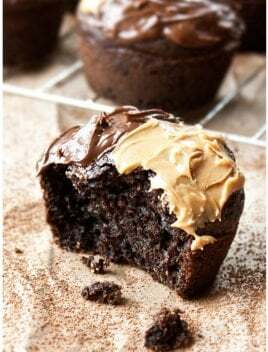 You can also use modeling chocolate. Ain’t my husband the SWEETEST? He remembers everything I make…heheheh. After our little conversation, I went scouring through my folders and found the pictures! I just LOVE this basket, especially the “weave” pattern. It just makes it look so REAL! 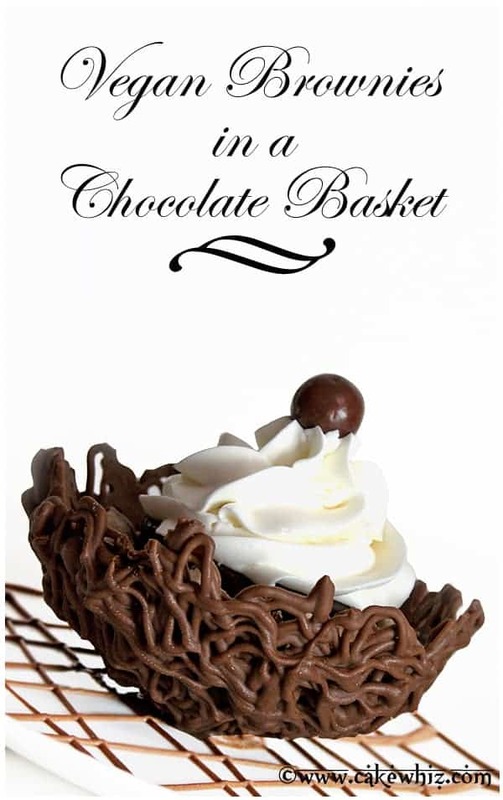 I used modeling chocolate to make this basket since it’s already brown in color. 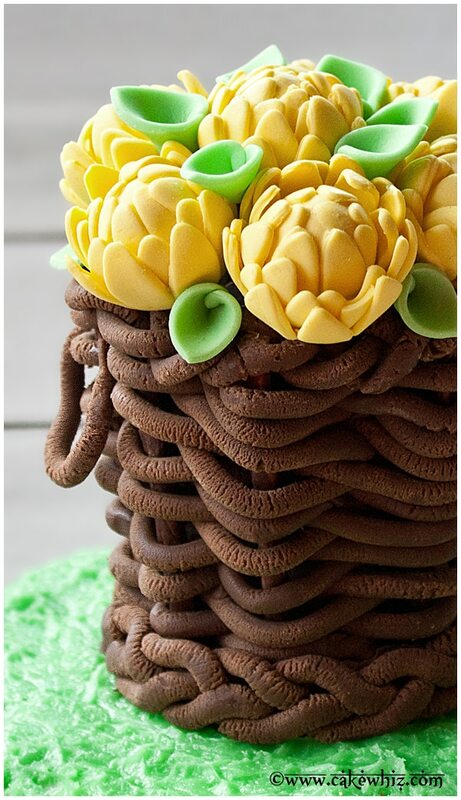 But you can EASILY use brown colored marshmallow fondant, gum paste or 50/50. 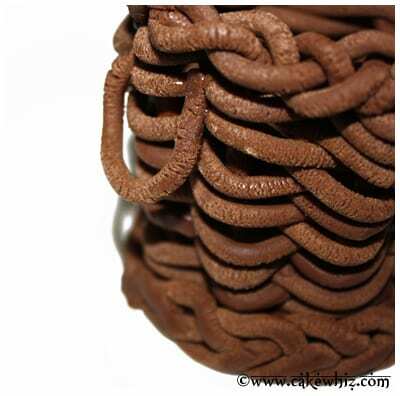 You can use brown colored marshmallow fondant, gum paste or 50/50 to make this basket. 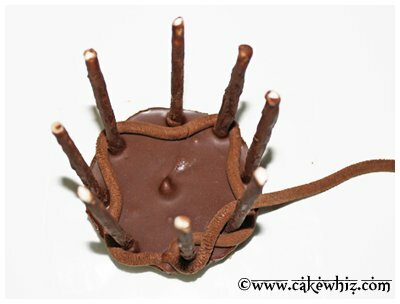 I used modeling chocolate in this tutorial because it’s already brown and I didn’t have to color it. 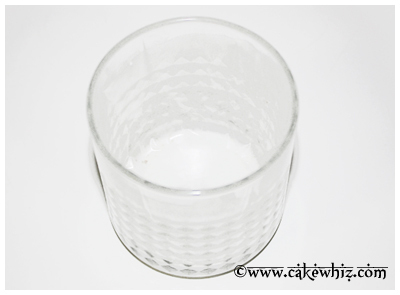 Rub shortening on the inside of your glass. 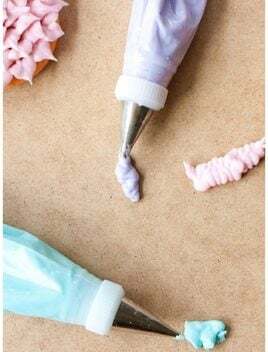 Cut out strips of wax paper and stick it on the inside. 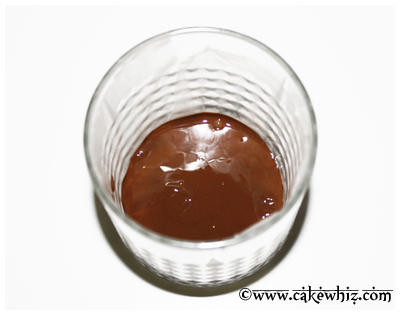 Pour melted chocolate into the glass. This layer of chocolate should be approximately 1 inch thick. 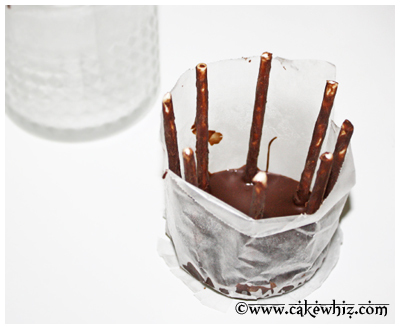 Cut the lollipop sticks or pretzel rods about the same height as your glass. You will need an even number of sticks. 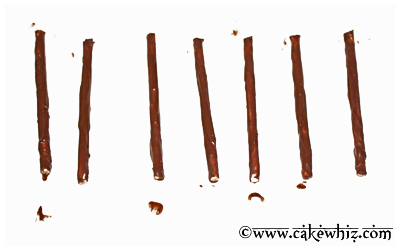 Dip the lollipop sticks or pretzel rods in melted chocolate and place them on a sheet of wax paper to dry and harden. 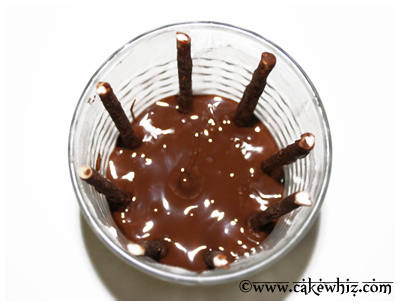 Stick those lollipop sticks into your glass of melted chocolate. 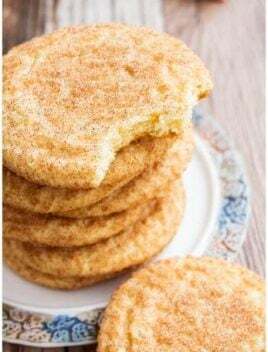 Make sure to keep them evenly spaced. 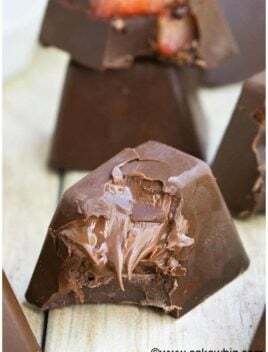 Place this glass in the freezer for about 15 minutes so that the chocolate hardens quickly. Take the glass out of the freezer. 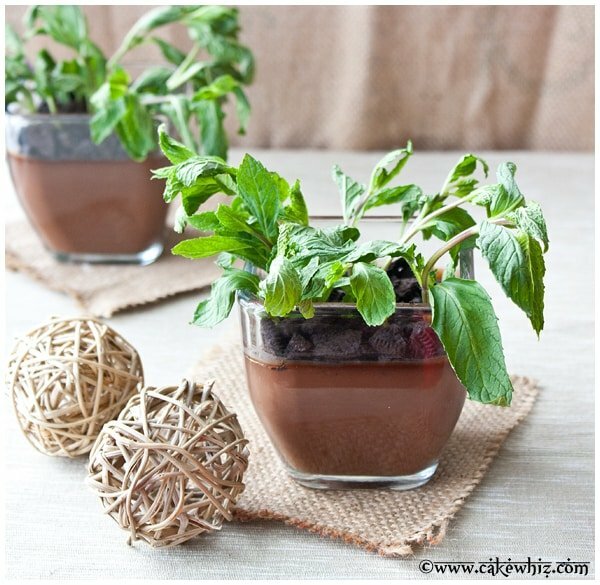 Gently remove the whole chocolate structure from the glass. 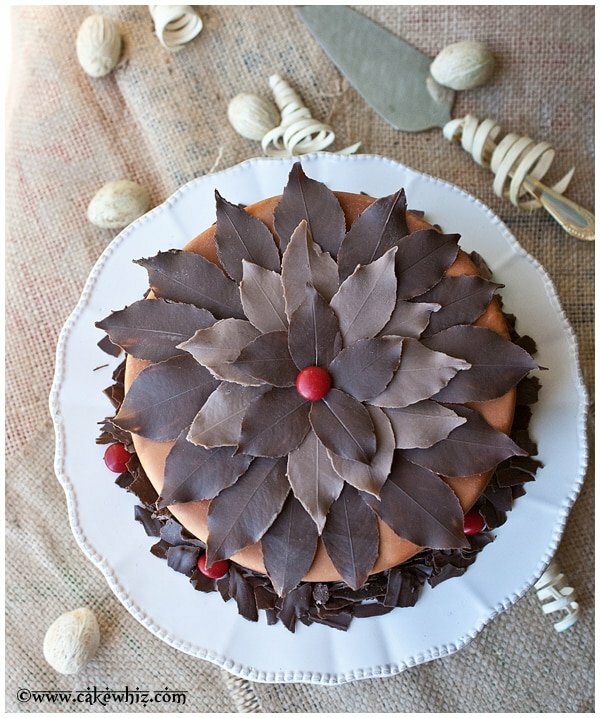 Make sure this whole chocolate structure is sitting on a sheet of wax paper. I did these steps to make the basket more secure. 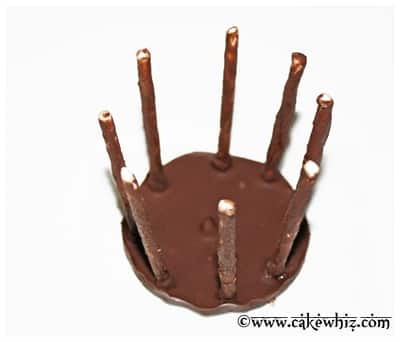 Roll out modeling chocolate and keep it about a quarter of an inch thick. 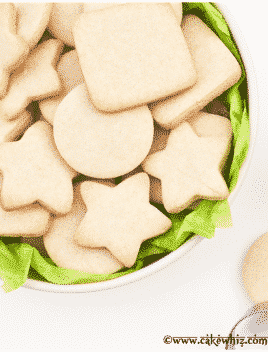 Use a circle cutter to cut out a piece. 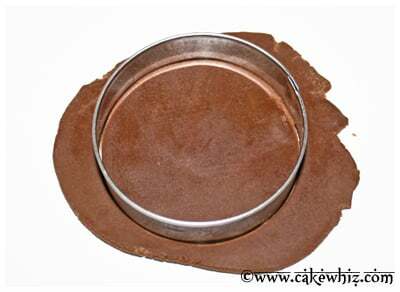 Make sure that the size of this circle is the same size as the base of your chocolate structure. 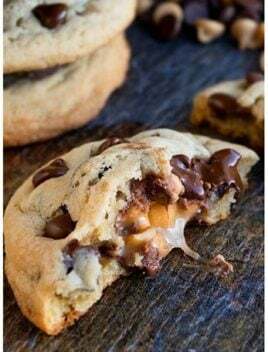 Brush some corn syrup or melted chocolate on top of this piece. 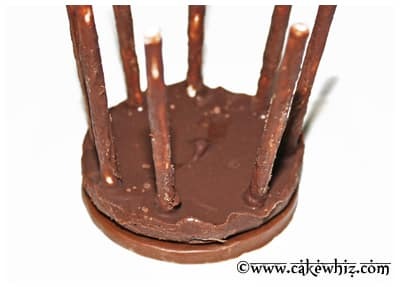 Place your whole chocolate structure on top of this circle piece and gently press it so that everything sticks together. Wait 15- 20 minutes until everything is dry and secure and then move on to the next steps. 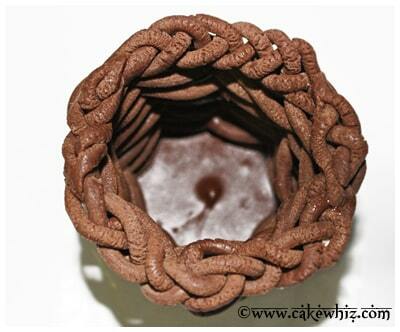 Use a clay extruder with the circle attachment to make many long rope pieces. Start running your ropes through the sticks carefully. 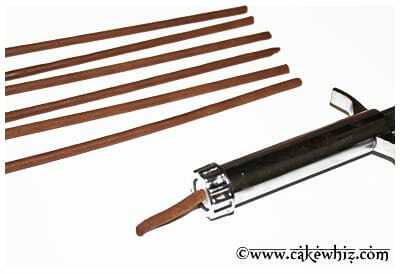 You go in though one stick and come out the other. Keep doing this until you have one row. Use the warmth of your fingers to pinch and stick the joint together. Now, take another rope and start going through the sticks again but this time, go in the opposite direction. Cut off excess with a knife and stick the joint together with the warmth of your fingers again. Keep running your ropes through the sticks until you get to the top. Make sure to leave some space on the top. 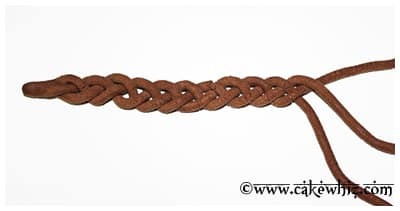 Use a clay extruder to make three long ropes and braid them. 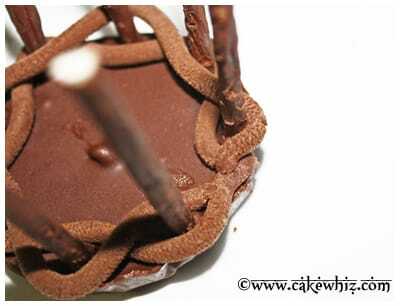 Stick this braid piece around the top of your basket, using some melted chocolate. 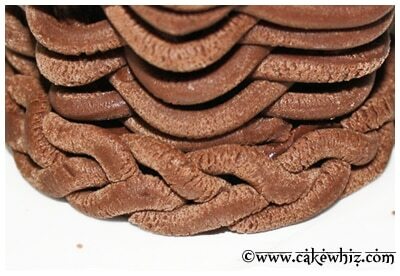 Make another braid and stick it around the base of the basket, using some melted chocolate. 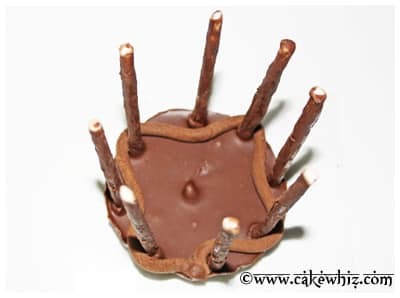 Cut out two modeling chocolate loops and stick them on the sides of the basket, using some melted chocolate. Let your fondant basket dry and harden. 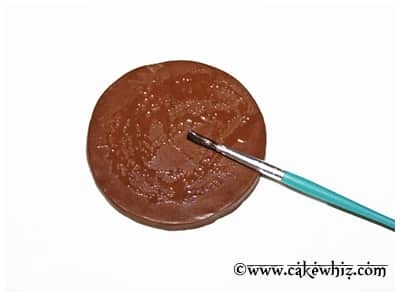 Drying/hardening happens very quickly if you are using modeling chocolate or gum paste. 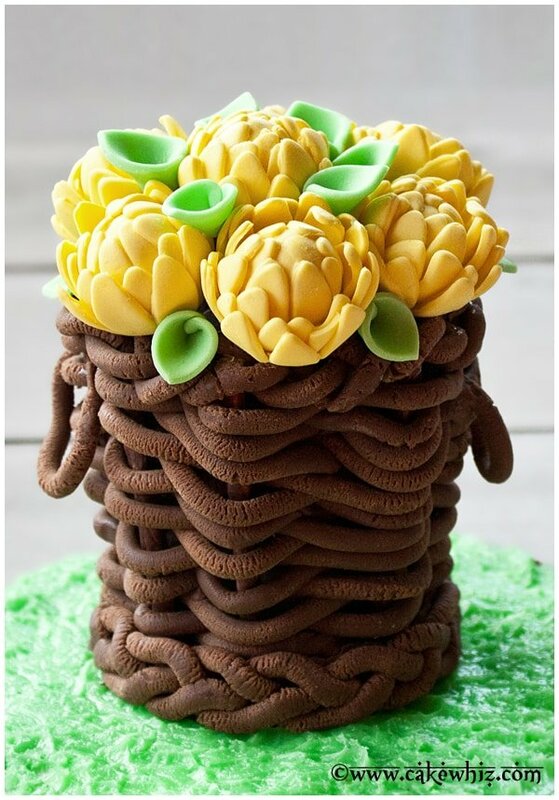 Then fill it with flowers and place it on top of your cake, if you like.